Flavius Hanniballianus was the brother of the Caesar Flavius Julius Delmatius and the grandson of Constantius I Chlorus and Theodora. Hanniballianus was named after Theodora’s father Afranius Hanniballianus of North African origin who was consul in 292 AD, and was Praetorian Prefect under Diocletian. He was the son of Flavius Delmatius who was a stepbrother to Constantine the Great which thus made him Constantine’s nephew. 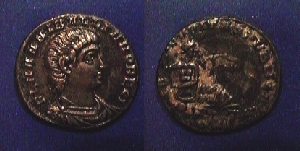 In 335 AD, Hanniballianus was married to the daughter of Constantine the Great – Constantia. He was also raised to the rank of nobilissimus and granted the extraordinary title of rex regum et Pontirarum gentium, and with it the right of coinage during his brief reign until 337 AD. His coinage issues were confined to the mint of Constantinople and typically displays a pagan style reverse type of the river god Euphrates. It is most likely symbolic of the territory (Pontus, Armenia & Cappadocia) over which the prince had jurisdiction rather than a profession of religion. Hanniballianus proved himself worthy of the honors and trust that Constantine bestowed upon him. Not only had he proved himself a wise ruler, but he also displayed a talent for military affairs. He successfully drove off the Persians from Armenia during his brief reign. 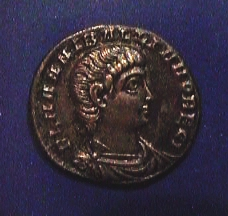 In 337, following the death of Constantine the Great, Hanniballianus was murdered in the palace along with nine other male descendants of Theodora by Constantine II, Constantius II and Constans.